In a pot, combine the yucca with enough cold water to cover it by 1 inch. Bring the water to a boil, and slowly simmer the yucca for 20 to 30 minutes or until it is tender. Transfer the yucca with a slotted spoon to a cutting board; let it cool; and cut it lengthwise into 3/4-inch-wide wedges, discarding the thin woody core. Spray a cookie sheet lightly with the cooking spray. 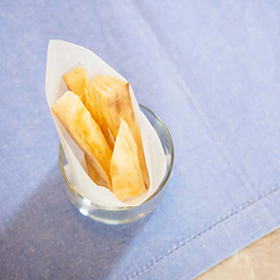 Spread yucca wedges in a single layer on the cookie sheet, and spray the wedges with cooking spray. Cover with foil and bake for 8 minutes. Uncover and return to oven to bake for an additional 7 minutes. Serving size: 1 piece (2 1/2 inches long). Amount per serving: 93 calories, 1g fat (0g saturated fat), 20g carbohydrates, 2g protein, 1g total fiber, 3mg sodium.